Managing KORI is all about popping the visions and plans into titled envelopes and pulling out the appropriate vision and experience to support the learning of the moment or the future plan. I know, it sounds confusing but it makes perfect sense to a manger who has been a professional Storyteller for twenty years. Six months later after an administration nightmare of meetings, fundraising, funding applications, journey planning, publicity development and organising team Tanzania 2010 – we made it to east Africa once again. The dream that was carried from our last visit in 2008, when we worked in the Debrabant Secondary school on the outskirts of Dar – was to bring arts and sports programmes to schools all over Tanzania. We knew for the programme delivery to be worthwhile it had to be consistent, and that we would need to return to train and develop skills that would sustain the inspiration of our programmes well into the future. The most wonderful part of the work in Tanzania is that it is a two way partnership each time. 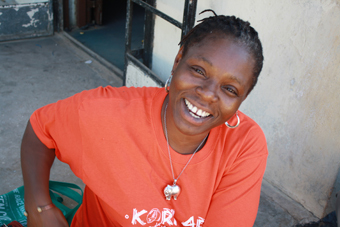 KORI Arts has worked with young people through the arts and sports in London for eight years. The work has established a hub of young artists and coaches with great skills and experience, keen to work with others. The programmes are especially focused at engaging and training young Africans and Caribbean’s in London through the arts, sports and academics; keeping them away from potential negative pathways. It was a logical step for the work to land in the continent of their heritage; Africa, where they could test the leadership skills they had gained at KORI in London, connect with African culture and broaden their life experience in the most incredible ways. Arriving on the 28th of June in Zanzibar and being met by our contact Edward Lusala was joyous. The team that had come together organically over the previous six months held a multitude of skills that divided into three parts; KORI Artists, documenters and seniors who came to support and gain work experience. The first few days after landing were both enjoyable and difficult as we were challenged by the organisation that had taken place in lieu of our arrival. The apartment, workshop and performance schedule at the Ziff Festival were still being developed and we had to be patient whilst these issues were sorted out. By the Friday however, we finally began work in our first school, Jang’ombe secondary School, organised by Robert Manoneolo, project manager of the children’s programme at the Ziff Festival. The expertise of the group settled into its various roles. KORI Arts were officially open to learning experiences and all the ups and downs of the journey. The partnerships in Tanzania will be strengthened by this visit and enable the youth of KORI to further empower the youth in Tanzania and that is both the magic and the dream!